We have been working with Cynthia Reeg for coming up to two years now and are always delighted to hear of her successes. She has had a busy summer with the publishing of two new books. 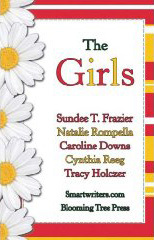 Cynthia very generously mailed a copy of The Girls to my ten year old daughter yesterday who was thrilled not only to recieved such a great book..but an author signed great book! ← How can I update my web site?